Sawmill 2019 Mac brings all the features of Sawmill PROFESSIONAL and adds improved scalability, extreme customization functionality, and support for MySQL, Microsoft SQL Server, Oracle Database, and Role-based Authentication Control (RBAC). 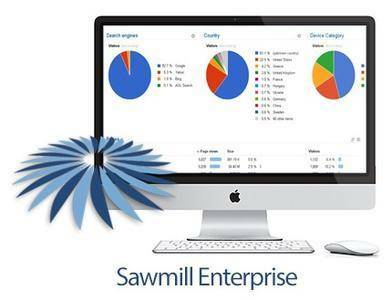 Sawmill ENTERPRISE is intended for organizations with existing enterprise database infrastructure, a hierarchy of users needing highly granular access to Sawmill functionality, and/or a need for up-to-the-second reporting from a large log dataset being continually imported into Sawmill’s database. Sawmill crack mac processes log data faster, by splitting log parsing across many processors (or cores). This can give a nearly linear speedup sawmill when processing large logs on a multi-core system, so an 8-core system can import data in 1/8 the time, during log import, the first stage of a database build. Sawmill ENTERPRISE also uses all processors and cores when running large queries. This speeds up some database building operations, for faster data import, and also speeds up some large reports. Together, these make Sawmill ENTERPRISE an excellent choice for anyone with a large dataset to analyze. 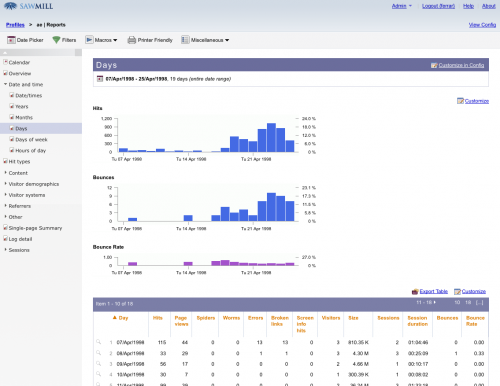 Complete customization of the web interface via Salang programming. Language support for English and other supported languages.